Fall is prettiest season of the whole year! 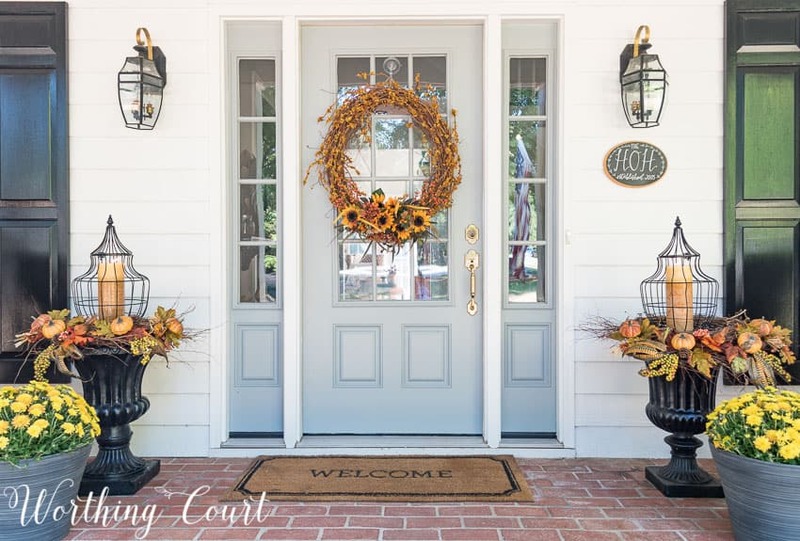 Get your front door and the interior of your home fall ready with these easy to make diy fall wreath ideas. I have a confession to make – I generally don’t purchase ready-made wreaths for any season or holiday. It isn’t because there’s anything wrong with them. It’s because of the price! I love to try out new looks each year for my seasonal decor, so if I were to purchase an expensive ready-made wreath, I’d feel like I have to use it every single year and that would get old to me. So – if you feel the same way, these easy and affordable diy fall wreath ideas will inspire you! 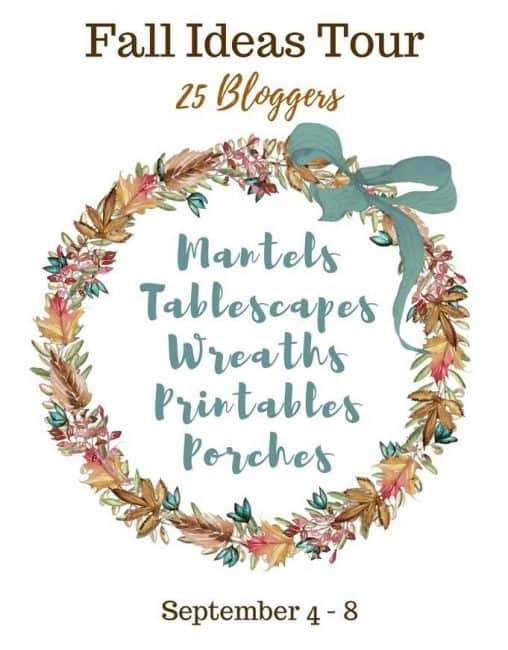 I’m sharing my easy diy fall wreath projects as part of the Fall Ideas Tour where 25 of your favorite bloggers are sharing fall ideas for your mantels, tables, free printables and porches. Be sure to check out the links to their posts at the bottom so you can get a peek into their homes! One of the easiest and most affordable ways to decorate a wreath or create a door hanging, is to purchase a faux foliage bush, especially when they’re on sale. Sometimes I cut the bush apart, but other times I leave it together and simply fluff it by twisting and turning the stems until I get the look that I’m after. Using foliage bushes will make you look like a floral designer even if you aren’t! 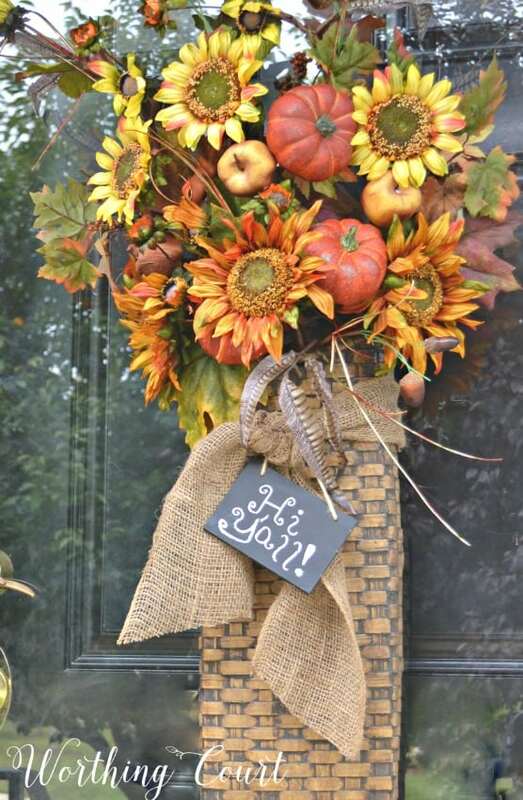 A few years ago, I used a long wicker basket for a welcoming fall arrangement for the front door of my former home. 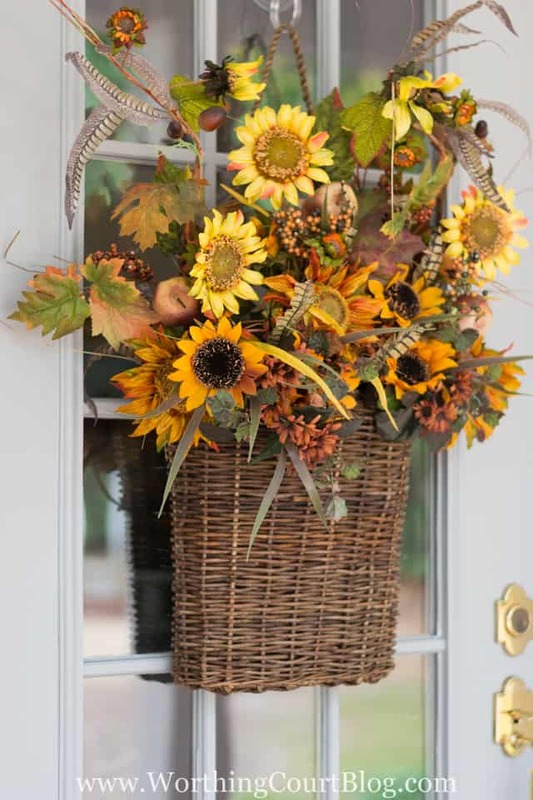 I purchased several long stems of faux sunflowers and a few foliage bushes that contained feathers, fall leaves, acorns and more sunflowers in varying fall colors. I added the tall sunflower stems to the back for height then added the foliage bushes for fullness. After fluffing the bushes, I added a few faux pumpkin picks for an added bit of fall color and finished the basket off with burlap ribbon and chalkboard sign. 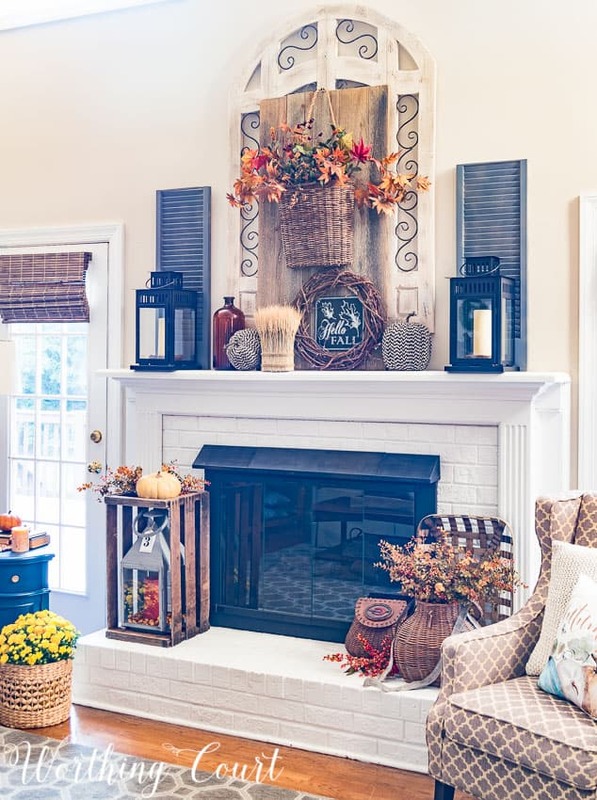 All of that foliage was a smart purchase on my part because I have used all of it over and over again in different fall decorations in my home – in vases and baskets as well as for fall decorations for my front porch. I reused the foliage in a different hanging wicker basket when I put together my very simple fall front porch one year when I was so starved for time that I needed something that I could put together in no time at all. Maybe you need an idea as easy as this one too! 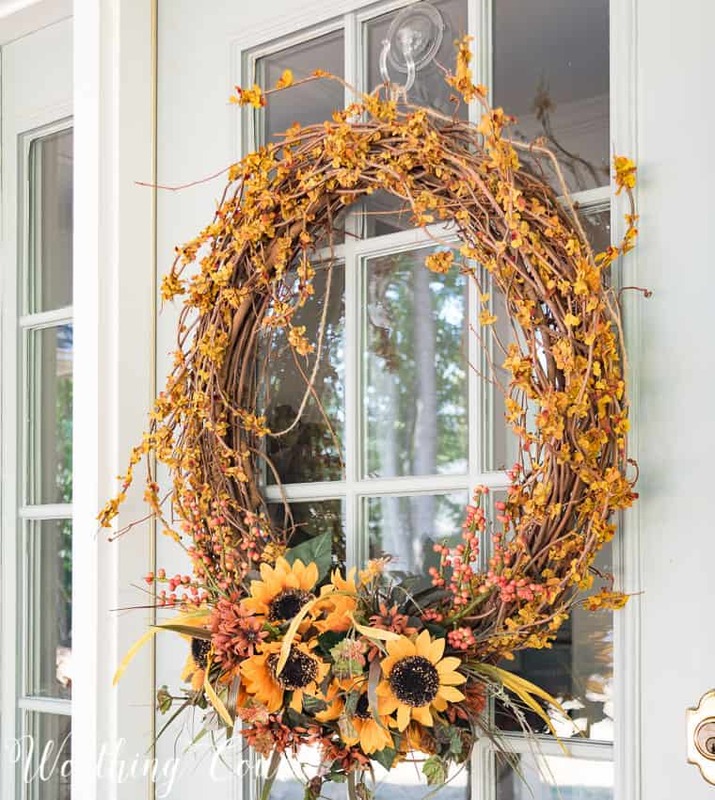 And I used much of it again last year on my fall front porch when I added some of the sunflower bushes to the bottom of the wreath on my front door and cut other bushes apart to add to the grapevine wreaths resting on top of my planters. To make the wreath I simply cut apart several stems of faux bittersweet branches and tucked the pieces into the spaces between the grapevines that make up the wreath. The bushes were tucked in too, but were also secured with a bit of wire. Nothing was glued in place so that when the season was over, I was able to take it all apart and reuse the wreath and foliage another time. In fact, this same grapevine wreath will be making another fall appearance in my home in just a few days! When doing my fall decorating, I find myself using wicker baskets and grapevine wreaths most of the time because their color and texture is perfect for this time of year. In my dining room last fall, I tucked a few berry springs onto a grapevine wreath and hung it from a mirror using a suction cup. I attached a couple of fall’ish candle rings to two of the plates on the shutters to act as wreaths and two very small grapevine wreaths to the other two plates. Y’all – this is so fast and so easy! 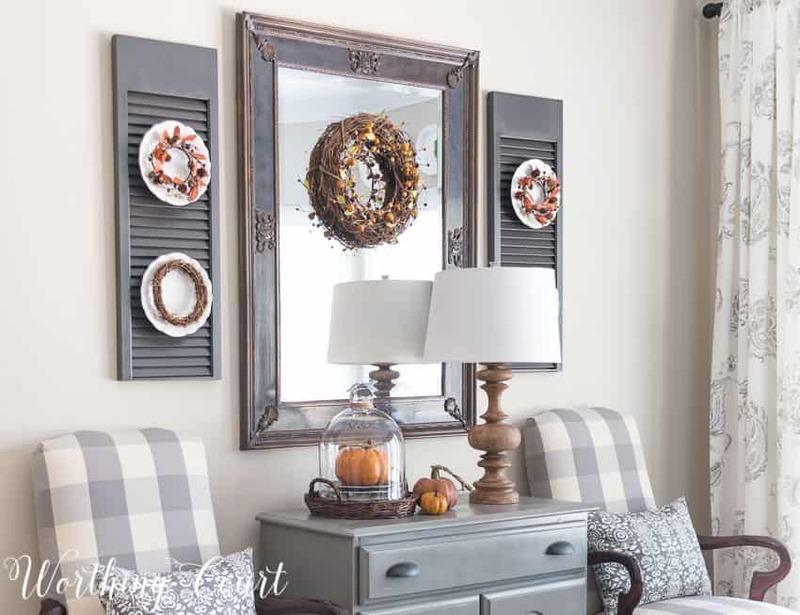 By hanging a wreath on the mirror, you kind of get double the bang for your buck because of the reflection. When decorating my fireplace for fall last year, I pulled out all the stops as I tried to reflect the bounty of fall’s harvest in my home. In addition to using a wicker basket and grapevine wreath for texture, I also used a layering technique to add interest. I layered my diy old barnwood against the large wood and metal plaque and then layered other fall decor in front of that. I chose to add another layer by using a hanging wicker basket filled with faux fall leaves and a few berry sprigs as my “wreath”. Super fast and super easy! I’ll leave you with one last idea. Have an old ready-made wreath that is looking a little sad and worn? Don’t throw it out! Check out the three different looks that I gave to this one wreath after years and years and years of use! And now, here’s are the links to all of my friend’s inspiring fall decorations! THANK YOU FOR STOPPING BY! DON’T FORGET TO PIN IT FOR LATER! All of your wreath ideas are so pretty. I especially love that basket with the foliage inside of it. Thanks for sharing so many ideas. So glad you joined us on the tour! I definitely can’t pick a favorite of your wreaths. I love them all and I always enjoy your porch and mantel decor. All of your wreaths are gorgeous!! They are all perfect for welcoming the best season of all! Happy Fall! I love how you’re reused and reinvented your fall foliage Suzy! I remember your wonderful metal topiaries, they’re my favorite addition to your fall front porch! Hi Suzy, I lost my comment…let me try again. I love how you repurposed and used your fall foliage for your multiple wreaths and baskets. Your metal topiaries on your front porch are wonderful and my favorite addition! These are all so great! It’s hard to choose a favorite one! Beautiful! I just happen to have a nice hanging wicker basket that I was wondering what to do with. Now I know how to fix it up. Thanks! All so very beautiful…I tend to use the same wreath too as a base as it fits my doors well….As always so creative and gorgeous…love your front porch!! Your ideas and talent amaze me. I love the various ways you have to share your Fall wreaths. So many great ideas! I have a wall pocket that I need to add Fall elements to. Now I have your ideas to follow. Thanks so much! This is just so warm and inviting … I love it! 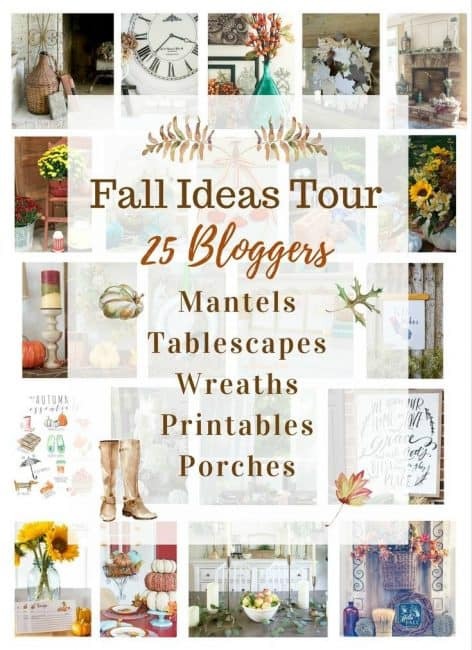 These are great fall ideas! Now if we could just have some cooler weather (& no hurricanes) in Florida! I LOVE all the Fall/pumpkins orange with your grey!!! Looks so good! Your wreaths are all so beautiful! 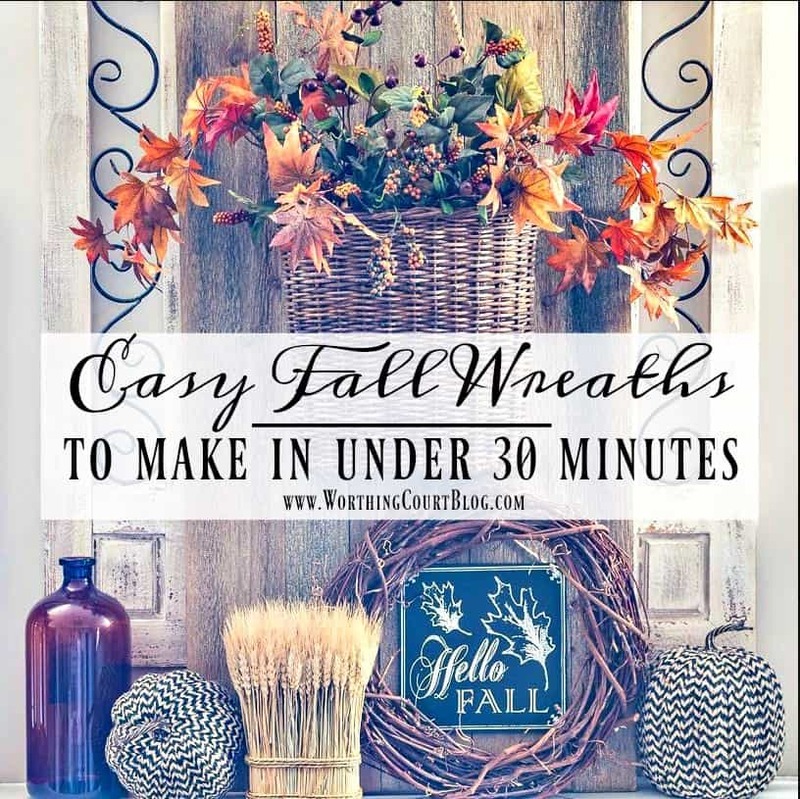 So many great fall wreath ideas! I especially love the woven basket with the sunflowers. Thanks for sharing your expertise with us. So glad you joined us on the Fall Ideas Tour! So many beautiful fall wreaths! It’s hard to choose a favorite because they all are truly lovely! So simple and no glue gun required!! I think I could probably actually make one myself! Thanks for the ideas and inspiration. Ohhh…so many lovely ideas! But I think the basket has to be my favorite. It’s so beautiful! I love all your wreaths, so pretty, but I especially love the mantle and hearth decor. Our fireplace is undergoing a renovation, we need to hurry up and get it finished so I can use some of your ideas! Love making fall wreaths! The colors of the florals are so beautiful! Thanks for the basket wreath idea for my door. It’s simple enough for even me to make and is so pretty. Lovely wreaths! Fall is my favorite season and these ideas bring me back to the craft table 😊 Thankyou for the inspiration! I love all these wreathes. I cannot even choose a favorite. They are so gorgeous. You are one talented lady. All of these wreathes are so appropriate for Autumn. i am in awe of your Fall wreathes. They are all so beautiful and well made. You did such a good job. Thank you for sharing. Your gorgeous porch gets me every time! And it looks so cozy with that gorgeous Fall wreath! Such beautiful decoration ideas! Love those wreathsl, and the flowers that are added. Adding flowers to any decoration is never too much. Thanks for the inspiration! What did you put arpund the grapevine wreath that is on your front door with the sunflowers and berries. It looks like you put something else around the rest of the grapevine wreath as well. I just love how it looks! Hi Audra. Glad you like my wreath! The extra things that you see are faux bittersweet branches that I cut apart and tucked in between the vines of the grapevine wreath. SO easy! I love how you suggest not to throw out seasonal décor. The idea of adding to it or painting it is economical and helps me not to get bored with the same thing each year. Great Tips! Wow – love that wreath! Well done! Love the grapevine wreath with the bittersweet. Simple and lovely! Great ideas for reusing wreaths over and over. I’m going to give that a try. I love a 30-minute craft. And your wreaths are always gorgeous! Love all of your decorating ideas and tutorials. I love that long wicker basket. I’ve seen them in my craft supply store but have never been able to imagine what to do with them. Now I know. Beautiful!!! The beautiful autumn door baskets make my heart smile! I am getting ready to hang my wreaths fro the Fall. I love the ideas you put on this post. You are so talented. Some great fall decor ideas! Thanks! I love wreaths! I like to use them not only as door decor, but around lanterns, candles and even ceramic roosters, so I was excited to see new DIY ideas. Thanks for sharing! Sunflowers scream FALL to me. I love them! I prefer a compact and colorful arrangement on my doors. The sunflowers in the basket is absolutely perfect for me. Thanks for such great ideas. Your blog is so comforting, Suzy. I love to see it in my inbox! Like everyone else I am so impressed with your wreaths! My income is really limited so your ideas and my pocketbook will get along pretty well! Thank you for supplying me with some solutions for my fall decorating! You’re so sweet, Lucy – thank you! Glad you’ve been able to get some ideas!